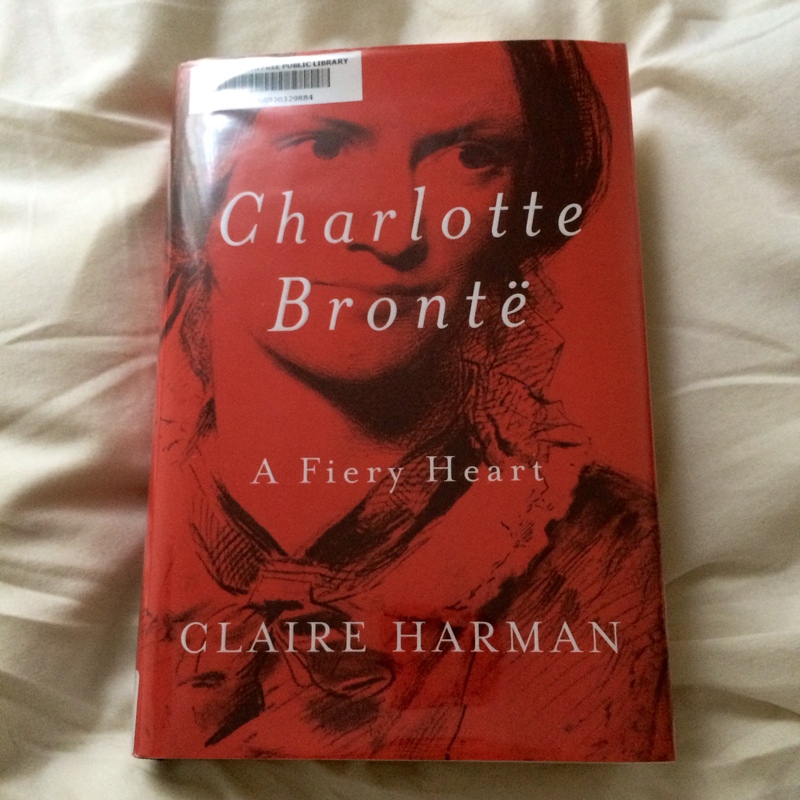 Charlotte Brontë: A Fiery Heart is an excellent literary biography, and I’m so happy to have read it. The writing is assured and graceful, and the subject couldn’t be more interesting. While Jane Eyre is my favorite novel, before I read Ms. Harman’s biography, I knew only the bare outline of Charlotte Brontë’s life. I knew that she was one of four (surviving) writer siblings, all of whom died very young. I knew that they lived on the moors, in a parsonage, and that at least a few of them died of tuberculosis (more on that in a bit). I knew Charlotte had attended a school she didn’t like (the basis for Lowood in Jane Eyre). I knew that she, Emily, and Anne published their first novels under pseudonyms. That’s not much to go on, but in general I’m pretty comfortable loving books without knowing much about authors behind them (and in some cases, I imagine that’s a very good thing). My point is that I came to this book as a beginner, not a Brontë fanatic (I’ve also read Wuthering Heights and Anne Carson’s amazing essay/poem regarding Emily in Glass, Irony, and God), so your mileage may vary if you’re already well versed in Brontëana. I’d also point out that unlike some literary biographies, this one doesn’t offer a big dose of literary criticism (though the novels are discussed, of course), which I appreciate. But Charlotte was also struggling with the larger issue of how she would ever accommodate her strong feelings—whether of love for Heger, or her intellectual passions, or her anger at circumstances and feelings of thwarted identity—in the life that life seemed to have in store for her, one of patchy, unsatisfying employment, loneliness, and hard work. What was someone like her, a plain, poor, clever, half-educated, dependent spinster daughter, to do with her own spiritual vitality and unfettered imagination? Aside from this frame, the book’s content appears in chronological order, beginning with background on Charlotte’s parents and then moving forward into her childhood (when she suffered the loss of her mother and two elder sisters, one of whom was a model for Helen Burns), adolescence, and adulthood. The Brontë household was an odd one; after his wife’s death Patrick Brontë dined alone, as did the stern aunt who came to raise Charlotte, Branwell, Emily, and Anne, and the children did not make friends in the village. They did create elaborate fictional worlds in secret (this secrecy would carry over into the daughters’ adult ventures) some set down in minuscule books (about two inches high) that still survive (and this may help to explain Charlotte’s woefully bad eyesight). The publication of the three sisters’ novels was a source of delight, but their felicity was short lived; Charlotte’s three siblings died, one after the other, in less than a year. The chapter about this terrible season in her life is simply gut-wrenching. I was in tears. Charlotte herself died just a few years later, less than a month shy of her thirty-ninth birthday—not of tuberculosis, as was long supposed, but of hyperemesis gravidarum (essentially, extreme nausea and vomiting during pregnancy that can lead to dehydration and malnutrition—its most famous sufferer is Catherine, Duchess of Cambridge), as Ms. Harman conclusively proves. Though now treatable, it wasn’t in the 1850s, and so Charlotte essentially starved to death, in near-constant agony for the first and only months of her pregnancy. This was the end of a lifetime of suffering, which included the loss of five siblings, her mother, and beloved friends. She was ill rather often, for many years had few outlets for her intelligence outside of her home, and loathed her work as a governess and teacher. Charlotte was also tormented by her own lack of beauty, which made socializing very difficult even when her publishing success meant that she was introduced to writers she admired, like Thackeray and Harriet Martineau. And yet this brilliant, difficult, imaginative woman channeled her ambition, secret passions, and fierce sense of justice into books that have long outlived her—through almost sheer force of will. Claire Harman’s book, which seamlessly incorporates letters and other archival material is a through portrait of this indomitable author. Reading this biography led me to admire Charlotte Brontë as a person just as much as I have admired her as an author. Like you, I have never delved deep into the Brontes – I only know what I assume everyone else knows. So, this sounds perfect for me. Sad, though, isn’t it? I often think about all the wonderful books they might have written had they all lived longer. I don’t think tuberculosis is a picnic, but I think her suffering was much, much worse than people thought for so many years. I really feel for Patrick Bronte. I think he was still standing after the loss of them all? Heartbreaking. I know I read a biography about Charlotte, but certainly not this one. It sounds interesting! I loved this biography. Like you, I picked up on the Belgian experience, the family sadness, and the new (to me) cause of death. I’d definitely read more by Harman. I would too. I think I read your review (and at least one other)—but I try to forget other reviews when I’m writing! This bio is on my to – read list and your review is lovely. Just happened to read another review of it on another (nameless) blog that was unsympathetic of Charlotte and her family, and referred to Charlotte as a stalker, so your review and impressions are a relief. What a difficult, sad life. I read another bio of Charlotte a long time ago so I know some things about her, and I can’t get over what she accomplished with her books – and the other sisters too – given their circumstances. Heroic. There is no way CB was a stalker (Was she difficult, and did she send too many letters, perhaps? Sure. But she wasn’t threatening and certainly would never physically importune anyone). Heroic is a good word. What a life. Oo, I didn’t know Anne Carson had written a piece about Emily Bronte. I’ll have to hunt it down — she’s one of my favorite poets! It’s AMAZING–it’s The Glass Essay in Glass, Irony and God. It sounds like her life story could have rivaled the most dramatic novels. I would love to read this. I’m glad to know that you found this biography to be well done! It certainly would rival a novel–I hope you get a chance to read it! What have you been reading these days? Sorry I just saw your comment now! I have so many books with bookmarks in them…for some reason I have been having trouble finishing them. I’m currently reading the ARC for Behind Closed Doors, a psychological thriller, hoping that a “deadline” and something fast will get me out of my slump. Next up after that will be Ladivine, which I am excited about! (hello, catching up on your blog) I found out Charlotte’s cause of death a while ago, maybe a year. I have to just tell myself “don’t think about it” because when I do, it’s just overwhelming… a little bit because of the huge loss of the entire family line, but mostly just that Charlotte lived through ALL that tragedy just to die in this horrible manner. Ugh. I don’t know that I’ll read this book just for that reason, but I *will* seek out this Anne Carson essay. I know! I wasn’t kidding about the tears–I was sobbing for a good fifteen minutes during one of those chapters. Anne Carson is a genius. I’ve had this on my list since it was announced. I’ve got so many that I need/want to read that I’m struggling to make decisions. I’ve got two fanfiction/updates that I’m trying to read in the next few weeks. I hear you—so many books, so little time.